An exploration of landscape through the painstaking and richly textured medium of fabric and embroidery, guest curated by Jody Clowes. Each of the artists in the show—Terese Agnew (Lacrosse), Chris Niver (Milwaukee), Leah Evans (Madison) and Sarah Gagnon (Madison)—use needle and thread to create work that, while unabashedly beautiful, embodies the contradictions implicit in our relationship to the land. 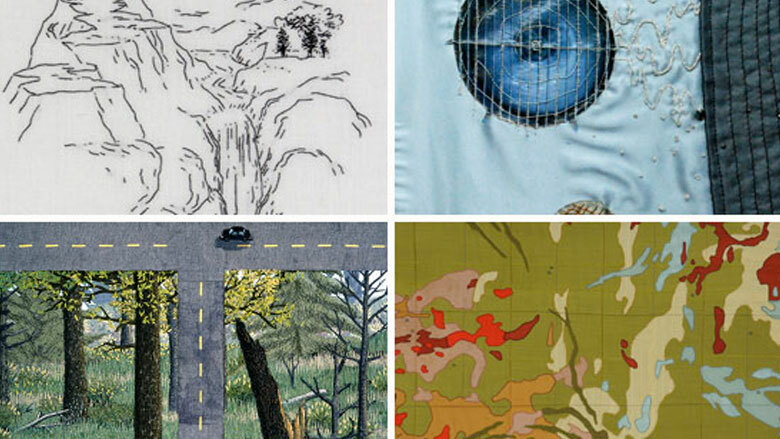 Stitched Ground: Four Artists Embroider The Land is supported by the Wisconsin Arts Board with funds from the State of Wisconsin and the National Endowment for the Arts, by a grant from the Dane County Cultural Affairs Commission with additional funds from the Endres Mfg. Company Foundation and the Overture Foundation, by the University of Wisconsin-Madison's Anonymous Fund, by Suzanne and Richard R. Pieper Sr., and by Ann Neviaser. Ongoing gallery support comes from DoubleTree Hotel-Madison and Robert & Carroll Heideman. The Wisconsin Academy thanks these sponsors for their generous support. We would also like to thank the Milwaukee Art Museum and the Renwick Gallery of the Smithsonian American Art Museum for their loans of Terese Agnew's pieces to the exhibition. Finally, we thank the exhibition artists, Terese Agnew, Leah Evans, Sarah Gagnon, and Chris Niver, for their enthusiastic participation in this project..
Terese Agnew began her art career as a public sculptor. Her early work included huge temporary installations that engaged hundreds of people in the art making process. In 1991 Agnew began making art quilts in addition to sculpture. My current work combines aerial photography, maps, and satellite imagery, as well as the more minute systems of the microbial world. I enjoy the play in scale between magnified microbial life forms and remote sensing images of huge tracts of land. A graduate of the UW's Design Studies program, Gagnon combines her photographs of manholes and exposed water mains with delicately beaded and embroidered underground pipes and conduits. Trained as a printmaker, Niver also works in black thread on white linen, translating his sketches of stagnant pools and drainage ditches into elegantly stitched meditations.